An RAAF F/A-18F Super Hornet of No 1 Squadron takes off from RAAF Base Amberley during Exercise Talisman Saber 2017. Image via Commonwealth of Australia, Department of Defence. A new report has found that 2,800 new jobs will be created in Queensland through government investment in Australia’s largest airbase, RAAF Amberley. Under the government’s investment, the Queensland economy is expected to be more than $1.2 billion larger, with thousands more jobs by 2020, according to advisory company KPMG’s report. Almost a third of these jobs are expected to be created between 2015-16 to 2019-20, with almost 2,800 jobs being added to the economy over that time. The report found that both Ipswich and the greater Brisbane region have benefited from investment in the airbase. "It is estimated that the greater Brisbane economy is $583 million larger (as measured by gross regional product) in 2015-16 as a result of the Base’s activity, with this contribution potentially growing to $1.2 billion by 2019-22," the report said. This is regional economic activity that would be lost without the base’s presence and operations. "With direct full-time equivalent (FTE) employment by RAAF Base Amberley estimated at 3,450 in 2015-16, the base’s additional indirect contribution to employment across the greater Brisbane region (by other sectors up and down the supply chain from the base) is estimated at 475 FTE jobs. "Thus it is estimated that the base currently directly and indirectly contributes total FTE employment of 3,925 to the greater Brisbane economy. By 2019-20, this direct and indirect job creation by the base could reach over 6,700 FTE workers across the greater Brisbane region, and almost 7,000 FTE workers in total across the state." Defence Industry Minister Christopher Pyne said Amberley is a significant driver of Queensland’s economy, and spending by Defence and its Australian Defence Force and civilian employees provides substantial benefits to the Ipswich community and surrounding region. "This is a great example of what happens when the government puts its shoulder to the wheel and leverages its defence spending to create Australian jobs and grow Australian industry," said the minister. "Recently, we’ve made a number of announcements which have led to this boom in Queensland defence industry. Companies like TAE, a company based in Amberley who will be maintaining the engines for Joint Strike Fighters from all over the world, have been big beneficiaries of the government’s commitment to Australian defence industry." 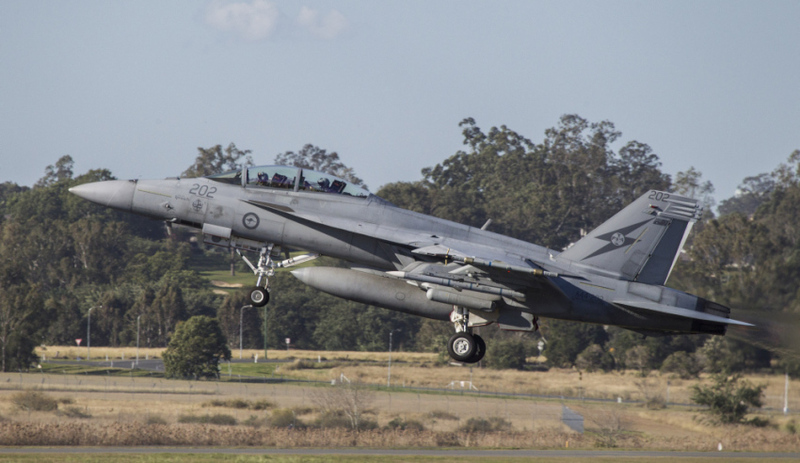 RAAF Amberley is home to Super Hornet and Growler flying operations, and the main objectives of these are to provide preliminary conversion training to aircrew, and conduct operational practice for qualified aircrew. Currently, Australia is the only country outside the US operating the Growler. Minister for Defence Personnel and Veterans Affairs Dan Tehan said bases like Amberley across the country provide a boost for local communities and create jobs outside the people directly employed by the base. "The beneficiaries of the Amberley base are spread across the community and include the construction and business services sector, wholesale and retail trades, hotel, food and telecommunications industries, and as members of the local community, Defence employees and their families also provide significant contributions to the education and retail sectors," Minister Tehan said.